The sky had to work up to it. After a couple of weeks with temperatures in the upper nineties and low hundreds, it took a few days of clouds and passing sprinkles to cool things off enough that rain could survive its trip to the ground without evaporating in mid-air in those beautiful but maddening long gray brushstrokes. This is a tough place to be a water droplet, but at last they came together in a grand, full-sized storm. And then the power went out. I tried not to think about how long it would be off or what would happen to the week’s groceries I had just put away. I stumbled and groped my way outside and sat under the overhanging roof to watch the rain, feel the cool (probably eighty-something) night air, and enjoy the view of T or C without lights. Occasional passing cars lit the streets, but the only steady glow was from the full moon behind the storm and one tiny cloud-hole with a star in it. My neighbors a few doors down were already sitting outside, their voices softer than the rain. Having had little time for writing all day, I brought paper and pen out with me to do the mandala for the book in progress. 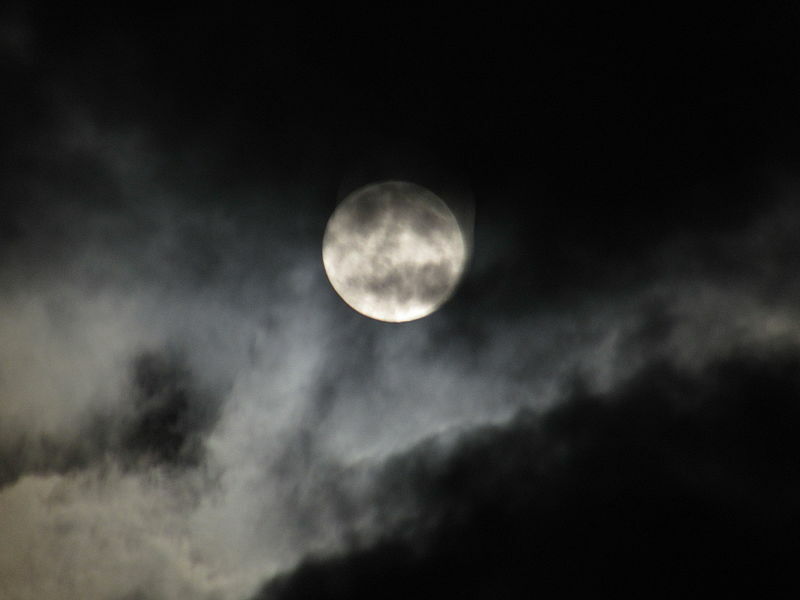 I could see well enough by the clouded moonlight, and it didn’t have to be a work of art. This process was due, like the rain. I had to work up to it with eight chapters first, to see who was going to be in this book and get a sense of where the conflicts and connections would be. Able to see well enough to draw, I made a circle with the names of my protagonist and her significant other in the center and all the other characters’ names around them, connected in complex patterns that swirled around the outside and wove through the inside of the circle. It was satisfying, and will remind me of relationships and loose ends and potential allies as well as enemies. This is as close as I get to an outline, and I will refer back to it often. I got the mandala idea from Writing as a Sacred Path by Jill Jepson, which I found in Santa Fe’s magical Ark Books several years ago. Every book I’ve written has had a mandala. I finished it and the moon emerged. The rain was over and big puddles reflected the moon back at herself from the streets and alleys. Then the power returned. My neighbors and I stood at the same time, and as if we were driven to light like moths we went inside to the electric glare, leaving the moon behind. I loved the quiet and the darkness of the town during the outage. I’m quite tired of the constant hum of coolers and fans. And with no street lights, the sky was beautiful. You’re right–the silence was nice, too. Lovely! You celebrate the rain and make use of the darkness. I need to check out the link about. Reblogged this on Marion Eaton.